The movie blockbuster 300 about the Battle of Thermopylae in 480 B.C that opposed an army of 300 spartans to the massive army of King Xerxes of Persia has already triggered a great deal of reactions from the Iranian Diaspora and the circulation of a petition condemning the film by some members of the Persian Community including academicians who regard the film as a distortion of history. Paradoxically even International politics has to some degree taken the movie more seriously than what it may have intended to be initially with a sheer condemnation by the Islamic Republic of Iran through the spokesman of President Mahmoud Ahmadinejad. The Iranian President is already known for his own radical rhetoric�s against the West and his call to wipe out the Stare of Israel from the Surface of the Map. Given the fact that the 25 century old Persian Monarchy was ousted by a popular revolution back in 1979, the reaction of the Islamic government in defense of the �image� of King Xerxes and the Ancient Persian�s seem�s paradoxical in the light of the current Iranian regime�s own poor record in terms of protecting Iran�s ancient archeological sites and its past denials of Iran�s pre-Islamic heritage and particularly of anything linked to the Persian Monarchy in general. That a Hollywood film like 300 may appear as a Washington led conspiracy against Iranians would certainly be exaggerated, however its release in the context of the tense international crisis in regard to Iran�s nuclear ambitions and a rising tension between the US, Iran and Israel, the epic film has at worst provoked a genuine curiosity for ancient Persian civilization and history beyond the Persian community and has encouraged debate over Iran�s historical legacy in the West. It has also encouraged Iranian filmmakers and artists to suggest projects that could in their mind rectify Hollywood�s recurrent mistakes in depicting Persians/Iranians on screen. Beyond the cinematic phenomenal success of 300 in the lines of George Lucas� Star Wars back in 1977 and the groundbreaking style and technology that may explain it, it is undeniable that the Iranian reaction is also partly justified by a patriotic upheaval of Iranians in general when confronted to attack�s on their culture and civilization. Should it be reminded that another Hollywood movie �Not without my Daughter� based on the autobiography of American Betty Mahmoudy had triggered a similar outrage including from Iranians of the Diaspora who had fled the Islamic regime in Iran. As a movie 300 has certainly offered ground for debate amongst Iranians of all circles and backgrounds. The political reactions it has triggered seem more motivated by principle and concern for our cultural heritage than by a serious adrenalin driven political recuperation that would be short-lived anyhow including if it were spearheaded by supporters of the Persian monarchy. 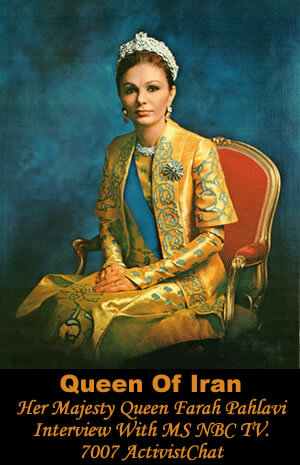 However in the face of the inevitable controversy and comparison�s that could be made between Iran today and Pre-Islamic or Pre-Revolution Iran one would have expected a reaction from one of the living representatives of the former monarchical era in the person of Shahbanou Farah Pahlavi the last Queen of Iran (still very popular in the Persian Diaspora Community) who was questioned in this regard by Iranian journalists at the KRSI Radio (LA/USA). The former Shahbanou gave the radio program a surprise call to thank one of the guests (Amir Bahadori) for an invitation she received to come to LA and inaugurate a Foundation honoring the Founder of the Persian Empire �Cyrus the Great�. KRSI: Your Majesty you have surprised us by this call and we are honored by it. FP: I simply wanted to say how much I was happy to see that a compatriot Mr. Bahadori has taken such a noble initiative and I was truly honored by his invitation when he contacted me, but of course I heard something on the program that I did not expect for I am coming to assist to this evening ceremony in honor of the Foundation of Cyrus the Great, aimed to help Iranian youngsters but I heard that Mr. Bahadori also intended something more important ( Notes from Translator: Apparently the Founders wanted also to honor the Queen during this ceremony) but I want to insist that I simply want to come and encourage your Foundation in your mission to help students in getting scholarships and well deserved opportunities to pursue their studies. Obviously the name of the Foundation ( Kourosh Bozorg aka Cyrus the Great ) is an honorable one that fills me with pride as well as I am sure all our compatriots. I hope indeed that we can all help Mr. Bahadori in his endeavors in favor of scientific and cultural research and in reaching out to young Iranians as to their host countries. KRSI: Your Majesty, we are all very touched by your generosity and have always appreciated your kindness. May I ask your opinion on the current debate in our community surrounding the fictional historical film 300 that has had both good and negative consequences for our culture and its image in general as perceived in the West ? FP: Before I answer your question, I would once again want to thank Mr. Bahadori in relation to his NowRuz invitation and for offering me a portrait of His Majesty the late Shah which touched me and my family as well as I am sure many of my compatriots to see your attachment to us and the late King�s memory. I hope to be able to join you soon and see this portrait that you have preserved with great attention. Amir Bahadori (AB): Your Majesty, I just would like to say that I am very touched and emotional to hear your voice and I am very honored to find out that you are attending this ceremony tomorrow tonight. FP: I just want to say that I am extremely proud to see that many successful compatriots like you in the US are active in promoting our Arts and Sciences and I truly hope that more similar initiatives will allow more of our youngsters to benefit from and I hope that one day this will also benefit our compatriots back home. In regard to this film, I have heard many things about it and unfortunately I do not find too much time myself to go to the movies but I most probably won�t go and see this film either. That said I would like to say that I am happy that our compatriots have reacted in great numbers and that even some foreign historical experts have reacted to denounce the historical fallacies in this movie. It saddens me to see that such a negative image of our history is portrayed instead of reminding fellow Americans here that several years ago an exhibition on 7000 years of Persian History was displayed to great success as well as in Europe. However it is also unfortunate that in the past 28 years the current leaders of the Islamic Republic of Iran have not done anything to improve Iran�s image in the world nor that of Iranian people and in that context such a film cannot really be welcomed in improving this image. That said I do not think that our rich and ancient culture can be ever destroyed or belittled by just one film or by the attitude of a government in power that is against our heritage and history in general. I just think that it is an irony that deserves attention that a regime that for the past 28 years has struggled against Iran�s historical heritage and culture has suddenly reacted to in defense of this heritage. Well � Its good. Obviously I think about the past and the 2500 years Celebrations at Persepolis and of course on all the criticisms that were made by opponents to the Persian Monarchy but more importantly by the Foreign Press particularly in the West. At the time most of these media�s ignored many of the most important aspects of this ceremony and its true intentions such as the numerous exhibitions, events to promote the culture of our homeland and the hundreds of organization committees that were created worldwide and held under the patronage of Kings, Queens and Presidents of these countries to promote and exhibit our culture and countries heritage to their own people. There was a time indeed when one would for example mention the Persian Gulf it would be respected as such and not confounded and distorted in its name as it is today where it is invariably called the Persian-Arab gulf or Arab gulf or Gulf to name a few � I have to say that this is one of the many negative consequences of the policies of the current regime in Iran. But I am confident that this will not remain as such for ever. Our country has experienced setbacks in the past and difficulties and has always overcome these obstacles and restored our national identity. KRSI: Thank you very much your Majesty. I would like to say that many compatriots in LA expect your visit in the City of Angels and we wish you a very nice trip. FP: I just wanted to ask Mr. Bahadori a favor and I say this with all gratefulness for his invitation and would like to say that it is with great pleasure that I come to your town. I would just want to say that I hope that this event will first and foremost honor the Iranian students and not me and that it will allow in the future to see students from Iran get your scholarships. I should say that I was a little surprised to hear on your radio that the event was meant to honor me first and foremost when in fact it should be an occasion on the contrary to honor all our compatriots and particularly our talented students. Please take this as a heartfelt reaction and not a criticism. Hopefully other similar occasions will allow us to get together again but please let�s use this opportunity to collect funds for your foundation so as to allow more students to benefit from your endeavors. I would like to note a personal anecdote of a recent letter I received from an Afro-American fan who had read my book (An Enduring Love: My Life with the Shah) and who wrote a kind note followed by the words of the great Martin Luther King �Everyone cannot be famous but everyone can be an honorable person� so I truly hope that the students who will benefit from you scholarship will one day become both famous and most importantly honorable people I am sure. AB: Thank You your Majesty. KRSI: Polite comments and Goodbye to the listeners. HAPPY BIRTHDAY TO OUR BELOVED SHAHBANOU. A patriotic first lady who has done so much for Iran, while she lived there. I do hope someday she can return and continure with all of her charity work and revive all of the organizations she helped to creat for the benefit of Iranians, especially women and children. Today is a Mother Day. 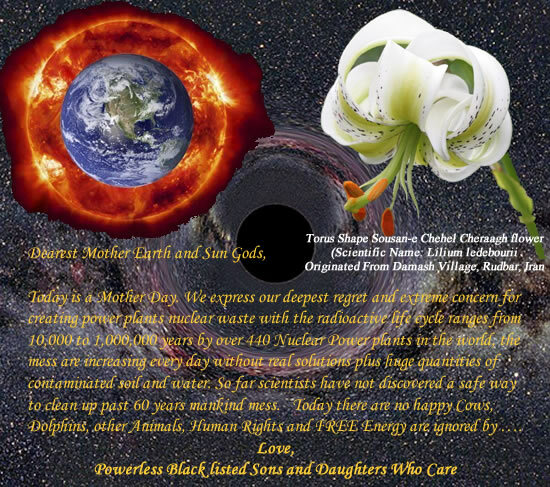 We express our deepest regret and extreme concern for creating power plants nuclear waste with the radioactive life cycle ranges from 10,000 to 1,000,000 years by over 440 Nuclear Power plants in the world, the mess are increasing every day without real solutions plus huge quantities of contaminated soil and water. So far scientists have not discovered a safe way to clean up past 60 years mankind mess. Today there are no happy Cows, Dolphins, other Animals, Human Rights and FREE Energy are ignored by �.